Breathe fresh, pure air in your home after an air duct cleaning in Rosharon. Over time, your air ducts can quickly become filled with pet hair, dirt, dust, and other airborne agents that can be harmful if breathed in on a regular basis. When you have clean air ducts, your air duct system will only recyle the cleanest air, which improves the overall health and safety of your home. Our expert services in combination with our antimicrobial treatment will have you breathing easier in no time. 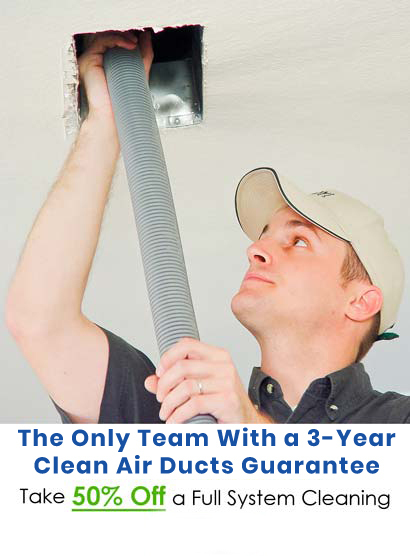 All full-system air duct cleanings come with a two-year guarantee. If you ever spot any mold growth on your air ducts or are dissatisfied with your services, we will come back to reapply our antimicrobial treatment at no charge to you. We want to ensure that you are completely satisfied with your Rosharon air duct cleaning not only today, but for years to come. Call KIWI Services today to schedule an air duct cleaning in Rosharon that will purify your indoor air and make your home a safer, healthier environment for the whole family.